If someone wanted a barometer to measure how the world has changed, especially in the last 60 or 70 years, international tourism might be a good place to start. The welcome outbreak of peace in the 1950s that led on to prosperity for much of the rest of the century, encouraged an enormous interest in how the rest of the world eats, drinks and exploits its cultural uniqueness. None of this would have been possible, of course, without a well-structured tourist infrastructure, the most essential part of which was the hotels industry. It is one of the hotel groups of this sector we are examining today; the Spanish-based Melia Hotels International. Melia’s history reflects the way the industry itself prospered. It opened its first hotel on the tourist island of Majorca in 1956, in perfect time to greet the onrush of mass Mediterranean tourism. By the mid-1990s it became the first European hotel group to be quoted on the stock exchange. Its founding family, the Escarrers, still control the company – which rapidly grew its international base through a series of big mergers. Today, Melia is one of the largest resort chains in the world. It is also Europe’s third-largest hotel group after the UK’s Intercontinental Hotels and the French group, Accor. Currently the group has more than 380 hotels in 43 countries on four continents employing 44,000 people with multiple brands like Sol Melia, Innside and Tryp. It has a portfolio of 97,000 rooms, plans to add 16,000 new ones in the next two years and has a market value of €2.6bn. Melia’s business model is interesting. It has committed itself to an ‘asset-light’ strategy, which means it doesn’t always own the hotels but instead manages or leases them. It is also gradually shifting to the premium end of the market, as well as focusing on the Asia/Pacific market. Examination of its asset portfolio shows both management and leasing each with one-third of total assets, with less than 15pc of its portfolio owned by the group. Its commitment to an ‘asset-light’ policy is shown in its pipeline of new hotels, where over 80pc will be managed with 90pc having premium brands like Gran Melia, or Paradisus. The group is already a significant player in Latin America and Cuba but today its emphasis is on the Asia/Pacific region where it currently has 40 hotels or resorts. It already has a presence in Vietnam, Malaysia, Thailand and China. To boost growth in the region it has concluded a partnership agreement with two Chinese property developers and set up a corporate and sales office in Shanghai. The group also operates Club Melia, a timeshare operation with 27,000 members having a large selection of company hotels or a network of 4,000 resorts. If, as mentioned earlier, the hotels sector is a barometer for a changing world, recent events are unsettling. Terrorism has found a major target in the tourism business. Extremes of weather (even the unpredictability of a prolonged heatwave in Ireland) have also made tourists unnecessarily insecure. There seems to be a lot more political instability about. Nevertheless, Melia – post the 2008 crash – has fared well. Financial results have been stable since 2013. Revenue in the last five years has shown a continuous upward trend, rising from €1.3bn to €1.9bn last year. Interestingly direct online sales now account for almost 30pc of all sales. Operating profits of €310m last year are in contrast to a small loss five years ago. The group shares are slowly recovering. They trade at €11.65, close to its yearly high. This is way above its €5 per share in 2010, but is still 60pc adrift from its price prior to the financial crash. Investors are happy that the critical ratio for ‘hotels’, revenue per available room (cognoscenti call it ‘rev par’), is showing an increase for the 30th successive quarter and that earnings per share is up 240pc in the last four years. 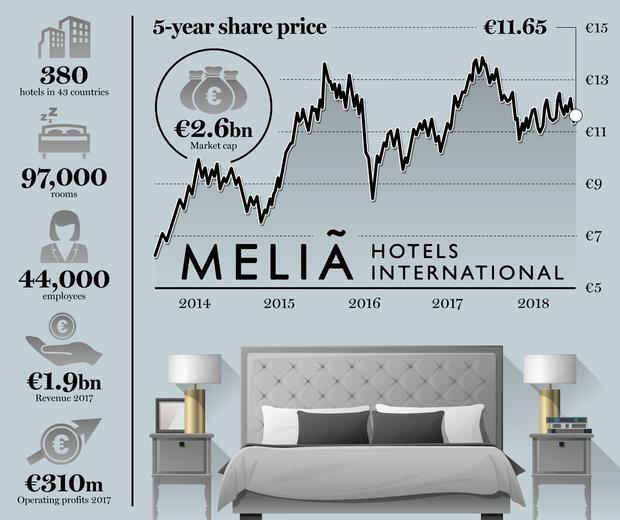 Melia, with its clear strategy and its tapping into the luxury market, is a share for the long-term investor.